Undergraduate introductory courses in cataloguing and classification. 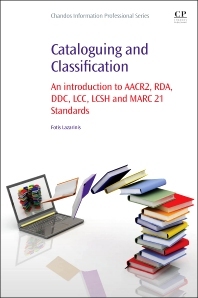 Postgraduate students of library science programscan also use this book as an essential resource for learning the basics of cataloguing and classification with the proposed "hands on approach" through the step-by-step examples and the practice material. Learners in community colleges and adult training programs. 3.6 Area 4: Publication, distribution, etc. Fotis Lazarinis, PhD, teaches library and information systems as an Adjunct Lecturer in the Department of Computer Science and Biomedical Informatics at the University of Thessaly, and in the Department of Archival and Library Sciences, Ionian University, Greece. His research focusses on information retrieval, organization and sharing using standardized XML structures. Adjunct Lecturer, Department of Computer Science and Biomedical Informatics, University of Thessaly and the Department of Archival and Library Sciences, Ionian University, Greece.